The CUSP trap consists of the combination of a superconducting anti-Helmholz coil and a stack of ring electrodes. 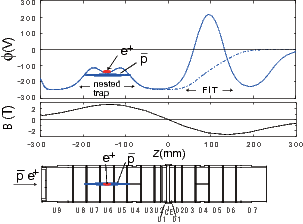 The CUSP trap provides the minimum B field configuration but still maintaining axial symmetry. Due to this symmetry, the CUSP trap realizes stable handlings of both antiprotons and positrons such as trapping, cooling, and mixing. 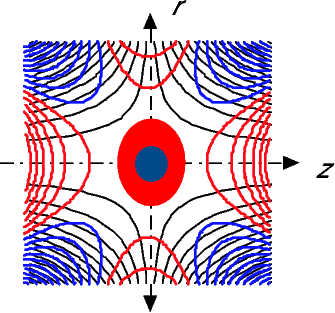 In the MCEO (Magnet Cusp and Electic Octupole fiels) configuration, magnetic cusp and electric octupole fields are superimposed. Although a neutral plasma confined in the magnetic cusp is hydromagnetically very stable, particles can still escape along the magnetic-field lines. In the case of non-neutral plasma, this leakage can be “plugged” by applying an electric octupole field, as illustrated in the figure. The MCEO therefore possesses advantageous plasma stabilization properties in addition to simply confining the non-neutral particle plasma, and experiments have already shown that it is well able to confine an electron plasma, with confinement time proportional to the square of the magnetic-field strength and a plasma density distribution that is nearly parabolic in the central region. 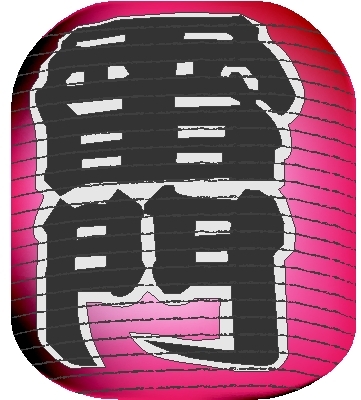 So-called nested well configuration is also adopted as shown in the above figure. The confinement well for positron plasma is nested in the well for antiproton cloud. This configuration has an advantage to make a spin polarized beam, that is, the polarization of 50K antihydrogen beam amounts to about 30% when they are synthesized near the maximum magnetic field region in the cusp magnetic field. Formed antihydrogen atoms in LFS (low field seeking) states are preferentially focused along the axis whereas those in the HFS (high field seeking) states are defocused, resulting in the formation of an intesity enhanced spin-polarized antihydrogen beam. This is a novel feature of the CUSP trap. By using this antihydrogen beam, we adopt Rabi-technique for the microwave spectroscopy. 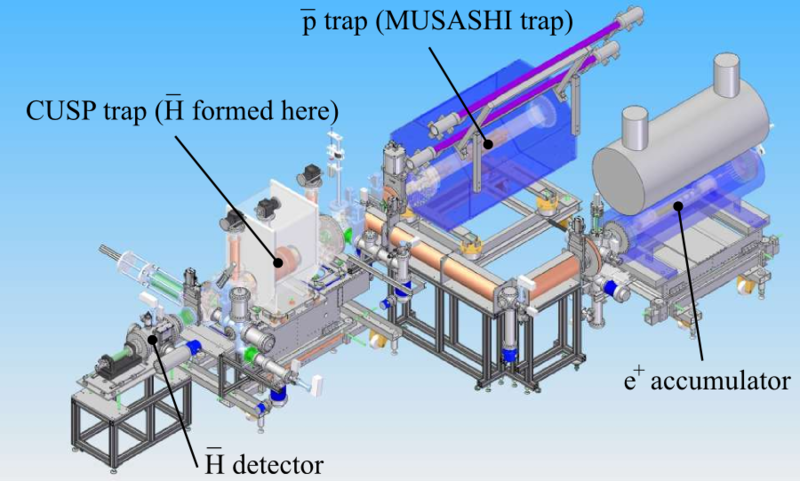 Cusp trap has been in operation with MUSASHI (antirproton catching) trap, poistoron accumulator, and also Hbar detector. "A source of antihydrogen for in-fligh hyperfine spectroscopy"
"Synthesis of Cold Antihydrogen in a Cusp Trap"
H. Saitoh, A. Mohri, Y. Enomoto, Y. Kanai, and Y. Yamazaki. "Radial compression of a non-neutral plasma in a cusp trap for antihydrogen synthesis"
M. Shibata, A. Mohri, Y. Kanai, Y. Enomoto, and Y. Yamazaki. "Compact cryogenic system with mechanical cryocoolers for antihydrogen synthesis." A. Mohri and Y. Yamazaki. "A possible new scheme to synthesize antihydrogen and to prepare a polarized antihydrogen beam." PukiWiki 1.5.1 © 2001-2016 PukiWiki Development Team. Powered by PHP 5.6.40-0+deb8u1. HTML convert time: 0.024 sec.